Here we are, with news from Santiago! The final preparation for the meeting hardly left us time to breath! The long, continuous arrival of the pilgrims from all points of the compass did not leave us a moment’s rest. The volunteers have arrived and everything is ready, or nearly so, for the great welcome tomorrow. Today, the big surprise was the arrival of the group from the farthest south of the meeting; ten young people from Punta Arenas, where the American continent plunges into the Antartic Ocean. For the first time, we were able to pray in the tent where all the prayers will take place during the meeting. 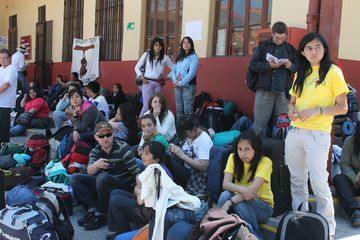 Now it is almost midnight and the pilgrims continue to arrive; 15 young people from Lima are knocking at the door… and we do not want to keep them waiting. Finally, everybody has arrived! A constant flow of people, diverse, joyful, each one seems to have come in a good spirit, in spite of long journeys and several problems at the customs. After an hour of various kinds of explanations, each pilgrim, with a city plan in hand, has gone off to their new family; to their welcome house, as they like to say. Some faces are joyful, some are tired, and some not convinced… what is going to happen to me? Who is going to welcome me after an hour in the metro or the bus? All the doubts, your own and those of others, were dispelled in the evening, during the first prayer. Everybody had found not only their family but also the way back to the park! A giant tent, yes, really giant, gave a warm welcome to the last arrivals as the entered the prayer quickly. The setting sun and the warm gusts of wind from the Pacific joined their voices to those of the 8,000 who were present. The far off voices of other young people and families walking in the park helped us better understand how important and meaningful it could be to pray at the heart of a great city, without pretension and without excluding anyone. At the end of the prayer, Brother Alois, after recalling the difficult year experienced by the people of Chile, spoke of the centrality of joy in our lives. We are together to go down to the wellsprings of the faith. By trusting in God, we want to find the impetus to go forward. Many years before Christ, already in the Old Testament, a believer made an appeal which is also meant for us today: "A joyful heart, that is your life.... So leave sadness behind!" We all undergo trials and suffering in our lives, sometimes for long periods. But we always want to try and rediscover the joy of living. The Holy Spirit sets the joy of the Risen Christ in the depths of our being. It is not only there when everything is easy. When we are faced with a challenging task, the effort can reawaken joy. And even in times of trial, some people dare to invoke that joy. It can remain buried like embers under the ashes, without going out. In praise, we let it well up in us, and all at once the present moment is illuminated. This joy will continue tomorrow, with times of reflection in the parishes, and with the theme workshops in the afternoon. Santiago is celebrating; a silent celebration that that is being prepared in the heart of each pilgrim. 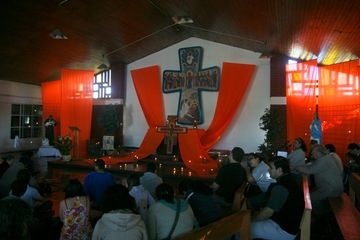 The joy that was promised yesterday became a reality in the parishes. The volunteers who spent four months preparing the people in the parishes to welcome the pilgrims could not find adequate words to describe the joy of the families and the young people of Santiago as they saw that the pilgrims were really there and that they could pray with them. 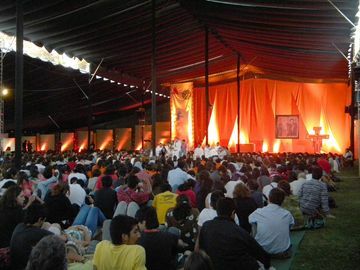 At midday, the intense heat did not scare the young people ; they arrived for the prayer with surprising punctuality. The meal distribution deserves a good “grade”: in half an hour, everyone had received their plastic bag containing the meal, ready for eating. In Latin America, good habits are not being lost; the ease with which people make new friends remains intact. For the meal, the young people scattered right across the park and they spontaneously came together in small groups of ten. Two Bolivians, four Chileans, three Peruvians, two from Argentina, and a Dominican…. That is a very balanced menu and a quite simple recipe! The theme workshops in the afternoon were very well attended, just like three years ago at the meeting in Cochabamba (Bolivia). 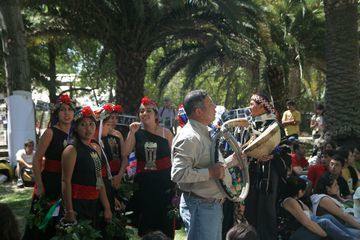 The different themes brought the pilgrims together in different places in the city: “Religious dance: triple prayer”, dances and traditional cultural expressions of Chile, under the direction of the Bishop of Iquique; “Trepay-antù: at dawn we seek you”, a meeting with Mapuche people, one of the indigenous peoples of Chile; “Hope and the humanitarian crisis in Haiti” with young people from Haiti; “Happy those who find refuge in you”, how to move towards security and trust in the Lord and in our brothers and sisters (Psalm 84), with Father Fidel Oñoro; “Migrants, an opportunity not to be missed: establishing just and enriching relations”. These are some of the titles of the twenty workshops that are offered. “Yesterday I told you that opting for joy is inseparable from a concern for other human beings. Opting for joy does not mean running away from life’s problems. Instead, it enables us to face reality, and even suffering and injustice. It fills us with unlimited compassion. Being witnesses to communion requires the courage sometimes to swim against the stream. The Holy Spirit will give each of you the imagination you need to find ways of coming even closer to those who suffer, to listen to them and to be affected by situations of distress. At the end of the prayer, like yesterday, a long queue lined up of people going to pray around the Cross. This expressed clearly how joy and justice are not simply empty words, or good ideas or praiseworthy attitudes; but how in Jesus they reveal themselves to be vital realities for each human being and how we can explore them even further. A family spirit; that is perhaps the best way of summing up Friday. It is as if everybody has known each other for years. Photos, jokes, appointments, exchanging ideas and experiences, promises: you can only believe that links are being formed that will last for a very long time. There are also many people who are meeting each other again, because many of those who took part in the meeting in Bolivia said they would meet again in Santiago. The need to meet together in order to see what it means to be “Latino American”, the desire to rebuild an identity that was forgotten during so many years when we looked “up there” or “to the other side of the Atlantic” seems to be gaining ground in depth. There are no speeches, no big debates, no taking up positions against whoever it may be: the prayer and the sharing of the Word set us face to face with ourselves just as we are and call us to reconsider our links and our options. Another word that is in the air is “communion”. How can we reconcile ourselves with what we are and what we are not without breaking up with anyone? How can we change things from within? Could this not be a definition of communion? During the evening prayer, Brother Alois reminded us that the Church is the first servant of communion. But at the same time, he invited us to see all the consequences of this: communion without forgiveness can be without any content. Believing in God’s forgiveness does not mean forgetting offenses. The message of forgiveness can never be used to condone injustice. On the contrary, believing in forgiveness makes us freer to recognize our own faults, as well as the mistakes and injustices around us and in the world. So then, it is up to us to repair anything that can be made good. On this difficult path we find an essential support: in the communion of the Church, God’s forgiveness can be granted again. Christ distinguished between the person and the offense committed. Until his dying breath on the cross, he refused to condemn anyone. And instead of minimizing the fault, he took it upon himself. There are situations where we do not manage to forgive. The wound is too big. We should then remember that God’s forgiveness never fails. As for us, it is sometimes only by stages that we succeed. The desire to forgive is already a first step, even when that desire remains engulfed in bitterness. Like each person, human societies cannot live without it. In Latin America and in many other parts of the world, the wounds of history are deep. So let us dare to put an end to what can end today, refusing to transmit to the next generation the bitterness of the past. In that way the future of peace, prepared in the heart of God, can be fully deployed. The evening prayer was marked by the presence of numerous personalities from all the Churches and institutions of the country. In addition to Cardinal Errázuriz, Archbishop of Santiago, and other bishops from Chile, leaders of various Churches of Santiago came to pray with us. There were also various mayors and ministers. Tomorrow will again be a day of festival, and, we believe, a real festival: where joy is nourished at the sources of forgiveness. Just when it seems that the young people have grown accustomed to the rhythm of prayer, with silence and songs in mapundungún (the Mapuche language), to frugal meals and incalculable lateness (although you could already count on that! ), the meeting is drawing to a close. However, this last full day of the meeting had an extra surprise in store for us. As at every stage of the pilgrimage of trust, a time had been set aside for people to meet together with others from the same country; to start to see how the pilgrimage can be continued when everyone has gone home. In addition to the joy and deep reflection that prevailed in all of these gatherings, the 400 strong Bolivian delegation decided to return the beautiful gesture that the young people from Chile had made towards them three years ago at the meeting in Cochabamba. 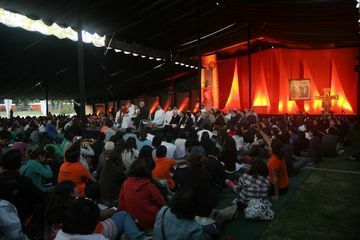 The Bolivians went to the place where the Chileans were meeting, over 2000 of them at that point, in the big prayer tent, and surrounded them with a giant embrace. “Ubi caritas et amor Deus ibi est” was the spontaneous response of the mass of young people; they are well aware that the more links of peace and fraternity cost a real effort the more they are true and lasting. A poem read by a child from Postosi, Bolivia, brought this moment to a close. It expressed what the meeting had been: a meeting with ourselves and with God that makes it possible to go towards our brothers and sisters as they are, in all simplicity. During the evening prayer, Cardinal Errázuriz and Brother Alois encouraged the young people, on their return home, to plant deep roots based on what they had experienced these days in Santiago. Today, faith appears more than ever as a risk, the risk of trusting. Taking this risk demands all our human abilities, those of the heart as well as those of the reason. Even as believers, we do not always try and deepen our faith enough. It happens that a gap grows wider between knowledge in the realm of faith and knowledge acquired in other areas. A faith which remains at the level of phrases learned during childhood has a hard time dealing with questions that arise when we are grown up. The search for a personal communion with God is thus all the more important. How can we go deeper into it? How can we nourish our hope through it? Even if we understand little of the Gospel, we can seek to grasp more starting from a few words that we try to put into practice. We can all ask ourselves: what is for me the words of the Gospel that touch me and that I would like to put into practice at once today and in the time to come? Tomorrow, no spectacular closing ceremony awaits us; simply the celebration of the feast of the Risen Christ in the midst of us, in the communities that have welcomed us. There is an unusual atmosphere at the moment; a serene joy has pervaded each of the host parishes. During the Sunday celebrations in which the pilgrims and their host families took part together, people were multiplying the words and signs to try to express to God what they had experienced. There is neither euphoria, nor exaggerated weeping, nor unrealisable promises…. just two certainties: God is waiting for us when we get home, to continue this pilgrimage, and to continue to sow trust; and an infinite gratitude.